AngelaPanama.com: New York, New York!!! Another last minute trip, this time to see my dawg Selam the Nomad in New York, New York!!! I can tell that it’s time for me to sit my a$$ at home for a while because shortly after arriving I started feeling homesick. That’s not to say that I didn’t have fun cause as usual I had a blast. A day of shopping in Manhattan = fun fun fun!!! I thought about getting a Candy Bra & G-String for Facundo but 1) I didn’t want a string of candy in my booty crack & 2) Facundo might get pissed when it breaks & there is candy all over the dayyym Bacardi factory!!! Then I found this weird shirtless collar thing-a-ma-bobber. 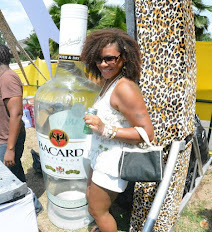 It practically turned my Bacardi t-shirt into a Bacardi suit! Ready for biznazz baby!!! Ima wear it with all my t-shirts for important, dressy type events!!! Mr. Bose didnt come this trip & he was missed!!! I thought these shots were awesome! We were in the heart of city, but lost as h*ll, might as well have been in the boonies somewhere. So close to our destination, yet so far away. Technology failed us & sent us in circles then guess what happened??? A hobo randomly starts doing push ups! Gotta frekkin love it!!! Highlight of my day! Stopped by a street festival in Little Italy & this chica right hurr was determined to win a Rasta Banana. Worked so hard to get it (not really, she just haggled like a mofo) and where did the beloved Rasta Banana end up afterwards? In the backseat of the car, on the floor. Saturday was spent celebrating Selam'z cuz Senaith birthday and we GOT IT IN!!! Unplanned slightly matching awesome outfits!!! Sunday night was a series of mistakes 1) Deciding to party till 5am knowing I had a 9am flight home 2) Drinking a Long Island Ice Tea even though I stopped drinking Long Islands 5 yrs ago cause they’re EVIL 3) Eating a sh*t load of heavy street food after the club 4) Going to straight to work after landing in Atlanta. On the flight home it got real bad real quick. The turbulence, the long island & the street food all joined forces against me. I’m sitting in the window seat, the flight attendants are coming thru with the beverage cart blocking the aisle to the tiny bathroom. I’m frantically going thru the back of the seat in front of me looking for a “barf bag” guess they don’t use those anymore. It took everything in me to hold back what was sure to be one of the biggest Up-Chucks of my life. You would think I would have learned my lesson about food, booze & flights. I blew chunks on the way to Hawaii, I ALMOST blew chunks on the way to Trinidad & Michelle blew chunks on the way home from Jamaica. I suppose I’m glutton for punishment… keep it coming baby! Anyway, I need to catch up on sleep cause I feel like a zombie (Zombies are REAL) "Peace in the Middle East"